I have been feeling an excitement in the air and a sense of change, but it has not so much to do with the upcoming election. One would like to believe that politics really changes things on a deep level. That is why a lot of us pay attention to all that is going on in the world, and we get sucked into the election news so easily. If nothing else we wear our political buttons and hang our signs up, yes on this and no on that, and we vote for all the right things to vote for. The change I feel though comes from meeting a lot of positive people these days and that keeps me from feeling more hopeful and less cynical. I just learned something basic about the seasonal changes here in this part of California that I will write about later, but somehow being in touch with the garden and these seasonal changes is also comforting to me these days. On Saturday I turned my trusty wagon into a traveling Free Farm Road Show and hauled a lot of seedlings and plants to Dolores Park for the RRFM and memorial for Kirsten, one the main people who helped start it and organize it. I also brought pictures of the Farm Stand, a bucket of walnuts from my backyard to shell, and a sign Free Garden Advice. I spent a number of hours just shelling walnuts and talking to people, and giving away plants. Later in the day a friend watched the stand and I walked around looking at all the stuff being given away, but wasn’t really looking for anything. It is amazing how many people haven’t had fresh walnuts from a tree and they were a big hit. A lot of people want to try gardening, but think they it is hard and they can’t possibly grow anything. I got a lot of questions about how to water plants and my general reply is don’t over water. That the most common gardening error is over loving a plant by drowning it. The other common error is neglecting a plant and letting it dry up or just death by neglect. I did enjoy meeting some really sweet people, both gardeners and wannabe gardeners alike, and connecting with some of Kirsten’s closer friends that have the same idealism that she did. A couple of other nice things happened at my Free Farm Stand Road Show. People came by and dropped off some pretty good tasting and giant grapefruit (they could have been pomelos) and another person dropped off some seeds, some mint, and lemon verbena. And someone gave me two high quality sharp knives to use in the kitchen, because they liked what I was doing. After the Dolores Park event I went to Clarion Alley to set up because Ivy asked me to come. I wasn’t there long because I started asking myself what am I doing trying to promote this project by having my sign up and my “informational wagon”. I really am not trying to inflate myself or what I am doing and started feeling silly being there when it was really about music (mostly loud music) and partying anyway. After being “farmless ” since we started, the Free Farm Stand looks like we will have a place to grow a lot of food to share every Sunday. 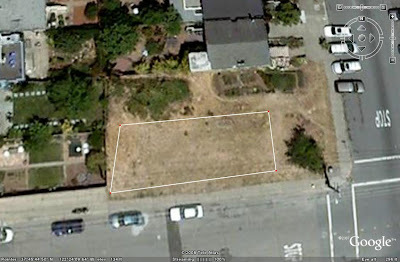 We have started working with the San Francisco Permaculture Guild turning a “vacant lot into garden plots”. David has put up a website to keep everyone interested up-to-date and try to explain what permaculture is (I am not sure if I am a permaculture person or not, but am open to trying out their approach to starting a garden from scratch): http://18thandrhodeisland.org/ . We have started having Friday workdays at 10am (I plan to show up at 9:30am). We could use pitchforks, wheel barrows, and flat shovels for the process in we are in of laying down wet cardboard and wood chips. We are also on the lookout for free clean soil (vs. fill). Somehow I had one of those moments where I felt a really learned something related to growing food. I have been feeling that the air is crisper and the light has changed significantly this last month and it felt like the season has definitely changed to autumn here. Our backyards are getting less and less sun as it is lower on the horizon. But another obvious clearer sign of season change is what is being harvested now and what is on our Free Farm Stand table. This week was such a clear example of what I am writing about. The amount of San Francisco local grown tomatoes is for the most part over. I have been talking to some neighbors whose tomatoes are just coming in strong, but they seem to be the exception. They are the ones I guess who got their tomatoes in late (and I have also grown tomatoes here into December that I planted in June instead of February). In Treat Commons, which gets lots of direct sun every ay, we still have tomatoes producing. I harvested the last tomatoes from a number of plants and Christy brought a big bag of tomatoes from the Corona Heights Community Garden. She also brought Cape Gooseberries that everyone gets excited about and they are still growing well and producing the Chinese lantern looking fruit. The one yellow zucchini plant at the Secret Garden is still producing zucchinis and I picked two of them to share. I have been saving the four pumpkins I grew this year to put out on the table for an autumn touch to the stand. I also had an unusual looking buttercup type squash to give away. The scarlet runner beans are still pumping out the beans and I had more than a handful to give away (and they have more flowers too). The basil in all the gardens is flowering and I am pulling up the plants and giving out mostly flowers from the plants. The African blue basil which is supposed to be a perennial is growing well and I keep clipping back the flower stems. I got a ton of leftover food from the Ferry Building Farmer’s market and some of it very seasonal. There were beautiful fuyu persimmons for example and the very end of the grapes from the one farmer who had them (they were getting soft but were very sweet). I also got from them some apples, cauliflower, a few potatoes,salad mix, and stir fry mix. Next Sunday Nosrat and Allegra are going to put on a cooking demonstration showing their ideas of how to use some of the produce we get. Figs are also ripening now. In my backyard I have a green variety called Genoa that are slowing getting soft. They never have been very sweet nor tasty, but I may try grilling them and seeing how they taste that way. A woman brought some figs to the stand and gave me one to taste. It was so beautiful inside I had to take a photo of it. It was sweet and yummy too! Another unknown visitor left a bag of figs in a bag on the fence with a sign for the Free Farm Stand.. This is terrific!. At the very end of the day when we were closing up there was one woman who showed up late and was taking the rest of what we had left over (not much). Sarah Miles who lives nearby came in with what looked like Granny Smith apples and dark fresh figs from her garden. I want to comment that we had a great crew of women volunteers helping me set up this week. Corrine showed up with a couple of friends from the gardening & composting educator training program (GCETP or what I have called “getup” class) they all took this summer. Also, later in the day Sara showed up who also took the class and having her Spanish speaking skills was really great. Some of our more regular helpers were there too, Jenny, Thy, Maeve, and Maria. There was plenty to do, besides setting up the stand, they were able to label plants and put them on the plant give away table and also to just hand out produce to everyone. It left me with time to talk to neighbors and answer garden questions. Food Program or neighborhood produce growing/sharing project? “I have thought a lot about this issue… I have always seen getting surplus food as a form of city gleaning and as part of a strategy to deal with hunger in addition to growing food. Using the waste food in our cities. At least two other people whom I have talked to sort of agreed with Christy and warned me about letting things grow too big. One woman said don’t give away bread let Martin’s do that. I guess I want to do two somewhat different things at the same time, and right now because the growing food part is going slower the free surplus local organic food is dominating the scene. For the second week in a row, I haven’t gone out to pick apples for the stand. I know where there is fruit, but I just haven’t felt like I have had the time to go out picking or researching the trees I have heard of. I did get some fruit from the Farmer’s Market, though it isn’t the same as picking your own locally grown fruit. While I was at the RRFM shelling walnuts someone told me about a huge walnut tree just blocks from the park. That would be a self-less job to harvest walnuts for the Free Farm Stand. Today we extracted over five gallons of honey. That makes the total of over 15 gallons of honey this year with one hive! Sorry to get political here, but personally I think we live in a sad world when we see spreading the wealth around as a bad thing. At the free farm stand we are spreading the wealth around every week from our abundant gardens. Sharing our harvest with neighbors and strangers. Spreading our love, compassion, and care around seems like a good idea to me. That is true wealth. This week I felt especially grateful for the generosity of so many people with their time and free positive spirit. It started Tuesday at Treat Commons and the Secret Garden. At both gardens we had four new people who showed up to help. The kids from Jamestown Center are fun to work with and we got a lot done at the Secret Garden. We are getting the beds ready to plant garlic and fava beans there tomorrow. I wanted to take a picture of the Jamestown crew but forgot my camera. Another high point of the day at the Secret Garden was meeting Thy who showed up to help. She is one of the most cheerful and enthusiastic volunteers I have met recently, and I really enjoyed working with her. She and I stuck around the garden after the kids left and we finished double digging the beds the kids worked on and I didn’t get home until 6pm. Then she came by on Thursday to help me get our backyard garden in shape and ready to plant. We also potted up seedlings and then she got the prize for taking home a shopping bag of walnuts to shell (the walnuts look a little too funky to hand out at the stand unfortunately). Work has begun on the mini-farm for the Free Farm Stand. I am working and learning with the San Francisco Permaculture Guild to create a garden the permaculture way. Dave Cody worked with Dave and laid out the contours of the land so we can build berms. So here in a nutshell is what was explained to me from Kevin. The land is on a very rocky slope so we are going to build raised beds or berms that lie on the contour of the land.Using a calibrated home made A frame tool, Dave determined the levelness of the ground. When water flows down the hill it will hit the berm and since it is level, the water will spread out to seek levelness. It will then soak into the mound before it travels further downhill. The berms are going to be created by laying down about 2 inches deep of wood chips, then a couple of layers of cardboard and then two feet of compost /mulch from Bayview Greenwaste Management mixed with manure or other compost and possibly some soil. I just afound out about some free soil that is going to be delivered on Friday! Friday was our first work day and because I had an appointment in the morning we started at noon which was a mistake because it was a hot day. Several people came and we pulled ivy up off a mound of rocks. I am hoping we can get more people because it is such a hard job. The current plan is to start with Friday mornings as a work day starting at 9:30am and work for a number of hours. Maybe at some point we can add a couple of Saturdays a month for those only available week-ends. The permaculture approach is to bury the woody stalks of the fennel and the ivy under the berm, but I must admit my worry about the ivy spreading. What we need now are not only more hands on deck, but the use of a pickup truck to move bales of cardboard from Whole Foods down the street to the garden. I may be able to get a bale in our van. This Friday a 20 yd load of compost/mulch is going to be dropped off. We haven’t determined the perfect method of removing ivy from rocks, but hoes, mattocks, or picks seem to help somewhat. If anyone comes and can bring those kinds of tools or clippers that would help. Dave said that the first three swales or berms are laid out. So once we get all the materials on site we can start constructing the berms. The weather has started cooling down and I started wondering what I might have come winter. For now there is still summer stuff coming in. A woman brought by five big beautiful early girl tomatoes from her garden on 14th and Guerrero and said they were planted late from seed and they are just coming in (I have been pulling up our dying tomato plants to get in fall and winter crops)…she must have a sunny location now. She also brought a few pomegranates from her mother’s garden in Orange Country (not really local, but they looked tasty). Jose brought more cucumbers from Potrero de Sol Community Garden and Shelly brought a lot of purple tomatillos from her plot that is in the same place. The cucumbers were gone before I could take their picture. And Steve dropped off some packages of organic garbanzo beans. So with the shelled walnuts and the beans we had some protein on the table. I had both tomatillos and ground cherries or Cape Gooseberries and it was nice showing people the similar fruits (and having the Cape Gooseberry plant growing in the garden is also wonderful so people can learn what they grow like). I cut up the rest of the banana squash from last week and had at least ten one pound pieces to give away. I realized that once they are cut open you have got to clean out the seeds and pulp inside or they start rotting. I saved some of the small pieces that I cut away from the rotten part and cooked it last night and found it delicious (steamed, mashed with a little non-hydrogenated vegan butter spread and maple syrup, ginger, and nutmeg). I had a beautiful selection of chile peppers, mostly hot ones. The rocoto peppers, the big fat red ones that almost look like habeneros are very hot and are perennial here and grow well. One surprise harvest came from the rooftop garden of the Chronicle building on 5th St. downtown. Kevin, Tara, and David from the permaculture guild on Friday brought me some apples and lemons from the trees, parsley, basil, Vietnamese cilantro (a strongly flavored plant in the knotweed family, Polygonum odoratum),and a few other herbs from that garden. Ty who was born in Vietnam loves the cilantro, but unfortunately it was not in good shape when I got it to the table. I forgot to refrigerate it and it looked dry and unattractive. I harvested the rest of the lettuce from my backyard and a lot of arugula from the Secret Garden. There were a few squash from Treat Commons and the Secret Garden, some miscellaneous greens from the Secret Garden and Treat Commons, Also, tomatoes from Treat Commons. Nosrat came by with a big bowl of green figs, some which were quite tasty and somewhat sweet. He also brought some pineapple guava from a garden in the Sunset. He and Allegra talked about having a cooking demonstration at the stand using food that is on the table. We decided to set that up for November 2. Jennny harvested some of the lemon grass and dried it and packaged it with an informational label. Robert came by with bags of bread again and it is very popular. Actually Jenny brought some bread too that I gave out. She is a gardenr at the city golf course and they have a restaurant there. Se asked the bread delivery guy if they have any bread they aren’t selling and he gave her some. It wasn’t organic or high quality as the other bread, but people did want it. I have to watch out what I give out, it could be a slippery slope giving out stuff that is not organic or stuff that isn’t vegan. I didn’t have as many apples as I would have liked. I just felt overwhelmed and too busy this week to go apple picking or fruit hunting. This week’s farm stand was the first hint that the number of people coming is growing larger. At the beginning there was a small line of people wanting to shop and I started feeling I little worried that it wasn’t as mellow a scene as I would want. And some of that also comes from the people who are shopping, that some of them see this as just a free food program which it is not exactly. At the end of the day almost all the food was given away which still surprises me. Talk about spreading the wealth I went to the “picnic”/potluck put on by the Pocket Seed Library on Saturday. While the crazy world outside was speeding along with crazy traffic and zillions of people going to the alcohol sponsored soapbox race on Dolores St., I walked into a beautiful bamboo garden behind the Southern Exposure gallery for a quirky only in San Francisco event. I am a bamboo lover and I was excited by the bamboo varieties were planted…the yellow bamboo with the green stripes was fabulous and worth the trip alone. There was lots of delicious food, though I wasn’t sure what was vegan and what wasn’t. Zooey, who along with Erin started the library project, made a delicious salad that was also beautiful to the eye. She told me she grew the salad in her dad’s backyard I think in the Sunset. I met Nikki who made a tasty vegan grape pie. Garden people are some of the best crowd to hang out with in my opinion. Besides the food there were lots of seeds being shared. I dropped off some of my favorite seed that I saved from this year and picked up a number of varieties of lettuce and Japanese spinach that I haven’t grown before. I also joined the Pocket Seed Library that cost me nothing and I am going to try planting some Tall Telephone Peas that are an heirloom and sound great. It seems our bees have produced another two boxes of honey. I am going to be extracting again soon and am open to a few others watching and helping out. Thanks to Thy coming by and helping me set up the stand and sticking around to help I was able to take more photos.